The diversity of building forms in Montreal in the 20th century is just astonishing. Sad to see so much vanishing in St. Henri, Ville Emard, Point St-Charles, Verdun, Cote St Paul, Little Burgundy, Griffintown, etc. I bike these streets every summer with glee. 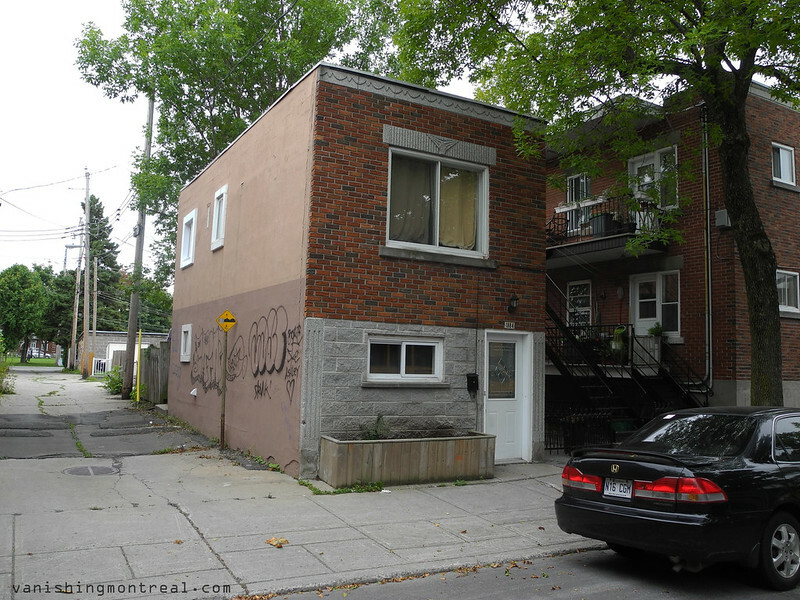 Funny thing is the new townhomes in the greater Toronto region are often less than 15 feet wide, but a huge row of them, across several blocks is not the same as one narrow building tucked among bigger buildings like in these narrow Montreal photos. This is such a weird little building. The big window lintels look original to the building (I can't imagine what they would have looked like: one giant double sash window? Two narrow ones?) and the the brickwork travels down the building to below what looks like would be the normal height for the first storey. That would explain the weird bottom window... . It would be really interesting to see what the original exterior looked like and what in heaven's name the renovator was thinking when he changed the exterior. This could be a fun place - either to try to bring back some of what it looked like or to do some minor reconfiguring of what's there now (i.e. get a bigger bottom window). And a roof deck. Definitely a roof deck. Man, I have real estate fever and an empty wallet. Alleyway houses don't look anything like these quirky charmers out here in Vancouver, that's for sure.